This Mexican-inspired tortilla-wrapped hot dog has all of your favorite flavors! Recipe created especially for HOFFY by Chef Jamie Gwen. Preheat your backyard BBQ to medium-high heat. To make the guacamole, combine the diced avocado, minced red onion, diced tomato, lime juice and cilantro in a mixing bowl. Season with salt and pepper and mix to combine. Grill the HOFFY Beef Franks until heated through and marked, about 4 minutes, turning often. Place 1/4 cup of the shredded cheese into the center of each tortilla then top with a spoonful of salsa and a spoonful guacamole, leaving a 1/2-inch border around the edges of the tortilla. 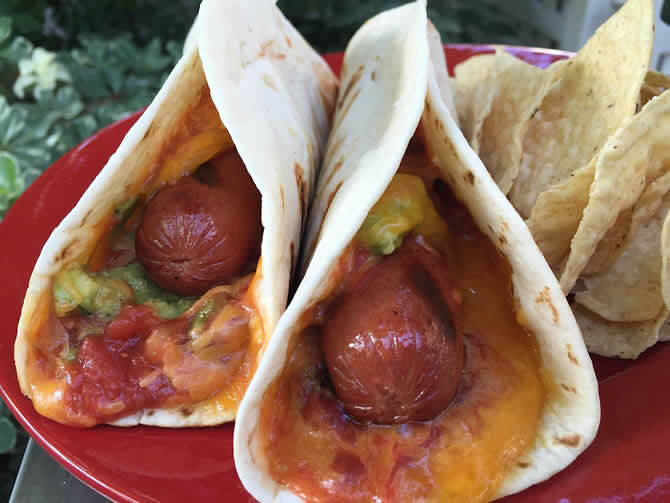 Place a grilled hot dog in the center of each tortilla and lift the sides of the tortilla to form a taco shape. Use two toothpicks to secure the “taco”. Line a portion of the BBQ with a sheet of aluminum foil and place the Taco Dogs on top of the foil. Close the grill and cook for 3 minutes to melt the cheese and warm the tortillas.